I was tired of listening to Tampa’s history. I’ve learned about the former lives of The Castle night club, Post Office, grave sites, etc… but I’m from nearby St. Petersburg. I’m more curious about the past lives of MY stomping grounds. 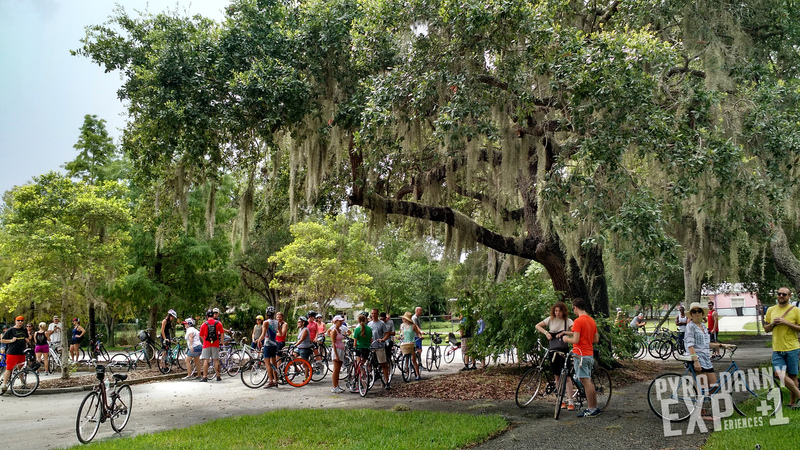 So when the History Bike Tampa group decided to temporarily switch their operations from Tampa history to St. Pete history last Saturday I leapt (pedaled?) at the chance. 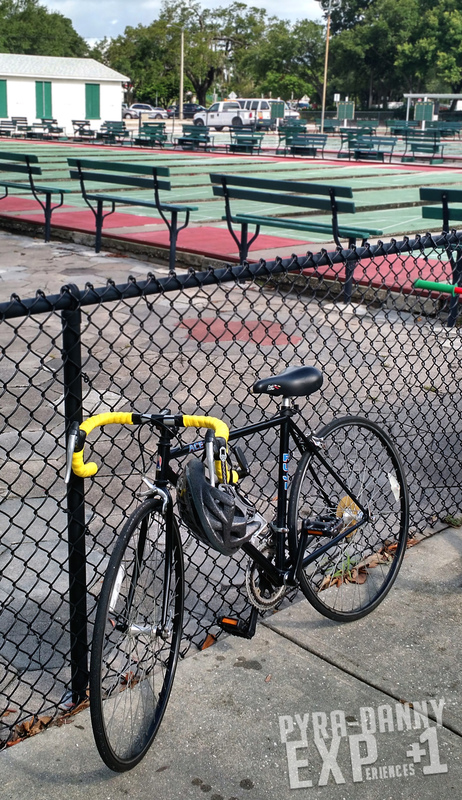 About 100 cyclists of all shapes and sizes gathered at the Shuffleboard Courts (a historical venue itself built in 1924 and continues to be a photogenic icon of the city) where we met our leaders for the ride. And… soon we were off! Entire lanes were filled with our colorful waves before we stopped just outside Bayfront Hospital. Next, the stretch south on MLK Blvd wasn’t a fun ride because of the many cars streaming by within feet of my tires. Yet I enjoyed looking at all the community restaurants and shops we passed because I barely travel this area. Brief stops at Lake Maggiore Park and Boyd Hill allowed us to take water breaks, stretch our legs, and use the restrooms. As we biked through a nearby neighborhood, out of nowhere a tiny park appeared housing another mound. The Calusa Indian Mound (also Pinellas Point Mound) permitted visitors to climb stairs to the top (less than 20 feet high). Nearby signs revealed the mound’s violent history in 1549 as a travelling Dominican Friar was clubbed to death on the site. Later we entered another small park inside the tree-shaded, very pretty neighborhood of Driftwood. The leaders pointed out another mound except it was hidden behind a house. Apparently there’s way more mounds dotting Pinellas County than we could fit on a bike tour. It was eye-opening to see history resting in plain sight. The Historic Bike Tour through St. Pete took almost three hours. We travelled almost 14 miles and I kept an average speed of 7pm—this was a very casual ride with enough breaks in between; excellent for children and elderly. The leaders were professional and energetic although one of the historian speakers was a bit awkward and giggly during delivery—probably nervous at presenting. Whether you catch this group in Tampa or meet them when they return to St. Pete I totally recommend taking a tour. It’s only a $5 donation and I guarantee you’ll see areas in a new light. It’s a great way to explore… and you’re on a freakin’ bike getting fresh air! Worth it.